Who wants dead skin cells hanging out on them anyway? 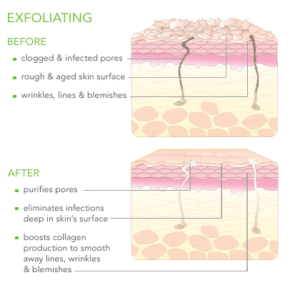 Exfoliation is the removal of the dead skin cells sitting on the skin’s surface. It leaves the skin smoother and fresher looking, and makes it easier for facial products like serums to penetrate the skin’s surface. 1) Mechanical Exfoliation. The dead skin cells are physically rubbed off with an abrasive. Examples of mechanical exfoliation include a salt glow, a body scrub that might use sugar or coffee grounds, or skin brushing. On the face, scrubs should use small, round, gentle abrasives like jojoba beads. A more aggressive and effective approach to mechanical exfoliation is microdermabrasion, which comes in two types – crystal and crystal-free, or diamond-tip, such as facial and body scrubs, body brushing and microdermabrasion. 2) Chemical Exfoliation. Enzymes, alphahydroxy acids (AHAs) or betahydroxy acids (BHAS) loosen the glue-like substance that holds the cells together, allowing them to slough away. Facial peels are a form of chemical exfoliation. 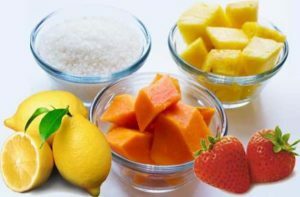 Body treatments might use mild chemical exfoliants like pineapple enzymes. Your exfoliation regimen will depend heavily upon your professional skin analysis performed by a skin therapist. 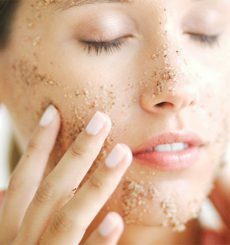 A professional skin therapist may recommend exfoliating with physical scrubs or chemical exfoliants, or both to deliver the desired result, can advise you on how often to exfoliate, and how to successfully incorporate exfoliation into your regimen.